Panama / Suez ist die erste EP des Trios Oren Ambarchi, Konrad Sprenger und Phillip Sollmann (alias Efdemin). Die drei Multiinstrumentalisten kollaborierten mit dem Ziel, sich subtil verschiebende, musikalische Verbindungswege zu erschaffen: klangliche Routen, die zwischen Kontinenten musikalischer Kategorien verlaufen. Das Resultat sind zwei Variationen krautigen, Groove-basierten Post-Technos, die sich mittels mutierter Polyrhythmik und läutendem, ätherischen Gitarrespiel entfalten – ein seltener Moment von Gitarre und Techno in enger Umschlingung. Mit dem Potenzial die Energie experimenteller Dancefloors aufrecht zu erhalten, lebt Panama / Suez von Ambarchis, Sprengers and Sollmanns respektivem Input bei gleichzeitiger Reflexion eines gemeinsamen Faibles für Pop und das Hypnotische. 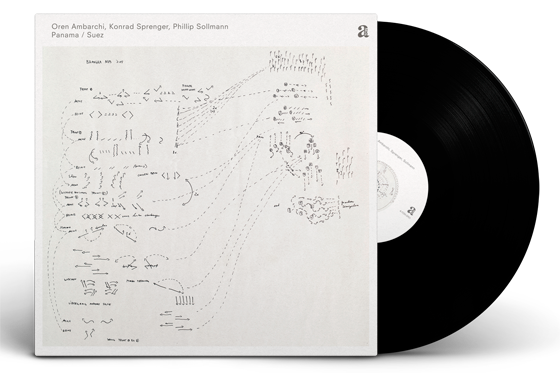 Panama / Suez is the first EP by trio Oren Ambarchi, Konrad Sprenger and Phillip Sollmann (aka Efdemin). The three multi-instrumentalists collaborated with the goal of creating subtly shifting musical passageways: sonic routes that run between continents of musical category. The results are two variations of kraut-y, groove-based post-techno that unfurl through mutating polyrhythms and chiming, ethereal guitar play – a rare moment of guitar and techno in deep embrace. With a potential to sustain energy on experimental dancefloors, Panama / Suez lives from Ambarchi, Sprenger and Sollmann’s diverse input while reflecting a common penchant for both pop and the hypnotic.